AZ Family Law Team is a local Arizona law firm that focuses on areas of the law pertaining to divorce and family. Founded by AZ Family Law Team, our firm emerged from her desire to guide families in crisis to light at the end of their family law crisis.AZ Family Law Team entered the legal profession with the simple goal of providing her clients with a strong and supportive presence, along with excellent legal advice. 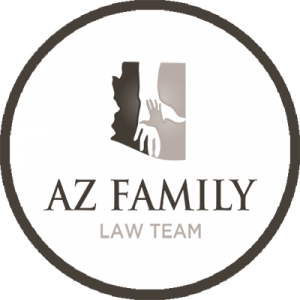 What Makes AZ Family Law Team, PLLC Different? It is no secret to us that many people have some trepidation about contacting an attorney. This is sometimes because someone they know had a negative legal experience or because their need for an attorney results from a negative conflict or crisis. Regardless of the underlying cause, it is our goal to redefine this perception. At AZ Family Law Team, PLLC we partner directly with our clients to ensure the best possible outcome in their family law manner. We believe that clients want and deserve a direct line of communication with their attorney, which is why we limit the use of paralegals on your case. Instead, when you hire an attorney from AZ Family Law Team you will work directly with that attorney – no middle man. Contact AZ Family Law Team today to schedule your free consultation to discuss your Arizona family law matter. At AZ Family Law Team, we believe that it is important for you to feel comfortable with your attorney. It is important to us that we introduce ourselves to you. Question: Who are you and what is your role in the law firm? I am the managing partner at AZ Family Law Team. In addition to managing the firm, I am also an active Arizona family law attorney. When you schedule a free consultation with the firm, chances are that you will meet directly with me to discuss your case. Question: Why did you become an attorney? I have always possessed a strong desire to help people. This is something I knew long before I decided to become an attorney. However, it was the response of my own family law attorney during a time of crisis that drew me towards the field.